We first featured this build back when it was still in its prototyping phase, but since then it’s been completed and used successfully to find a number of anomalies on the local power grid. It takes inputs from the line, isolates them, and feeds them into MATLAB via a sound card where they can be analyzed for frequency content. It’s been completed, including a case, and there are now waterfall diagrams of “mystery” switching harmonics found with the device, plus plots of waveform variation over time. There’s also a video below that has these harmonics converted to audio so you can hear the electricity. Since we featured it last, [David] also took some feedback from the comments on the first article and improved isolation distances on his PCB, as well as making further PCB enhancements before making the final version. If you’ve ever been curious as to what you might find on the power lines, be sure to take a look at the updates on the project’s page. The essence of hacking is modifying something to do a different function. Many of us learned as kids, though, that turning the family TV into an oscilloscope often got you into trouble. These days, TVs are flat and don’t have high voltage inside, but there’s always the family robot, often known as a Roomba. 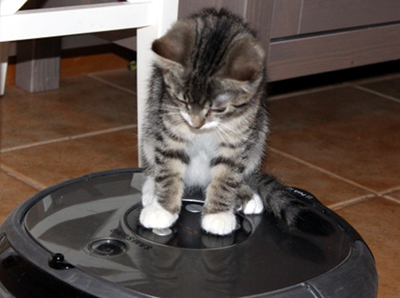 Besides providing feline transportation, these little pancake-shaped robots also clean floors. If you don’t want to evict the cat and still get a robust domestic robot platform for experimentation, about $200 will get you a Roomba made to be hacked — the iRobot Create 2. [Gstatum] has a tutorial for using a Raspberry Pi and MATLAB to get one quickly running and even doing basic object recognition using the Pi’s camera. The code even interfaces with Twitter. The impressive part is the code fits on about a page. This isn’t, however, completely autonomous. It uses a connected phone’s sensor’s so that the phone’s orientation controls the robot’s motion, but the robot does use sensors to prevent driving into walls or falling off a cliff. It also can detect being picked up and uses the Pi’s camera to detect a green flag. [153Armstrong] did a short post on how easy it is to generate waveforms using Python. We agree it is simple, but actually, it isn’t so much Python per se, it is some pretty cool libraries (SciPy, in particular) that do all the hard work. That may be splitting hairs, but it is worth nothing that SciPy (pronounced “Sigh Pie”) also does other handy tricks like Fourier transforms, too. You can see a video of his results, below. The code is simple and one of the commenters pointed out an even more efficient way to write the data to a WAV file. The basic idea is to create an array of samples in a buffer using some features of SciPy’s NumPy component. If you’ve taken any digital signal processing classes at a college or university, you’ve probably been exposed to MATLAB. However, if you want to do your own work, you might think about Linux and one of the many scientific computing applications available for it. [David Duarte] recently published a three-part tutorial on using Octave to do scientific audio processing. The first part covers basic reading, writing, and playing of audio files. Part two covers synthesis of signals, plotting, and some basic transformations. Modulation is the topic of the third part. If you prefer your tutorials on video, you can check out the video below. We’ve talked about MATLAB before in the context of message cracking. Then again, some of the best signal processing is done by humans. If you don’t like Octave, you might try Scilab, another Linux package that is similar. There’s also Freemat, Sage, and Spyder. Of course, you can also run MATLAB under Linux.